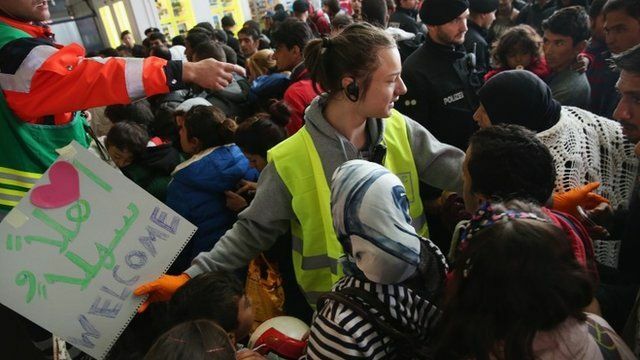 Warm welcome for migrants in Munich Jump to media player Thousands more migrants and refugees have continued to make their way to Austria and Germany. Meeting Germany's settled migrants Jump to media player As thousands cross the border into Germany, Chancellor Angela Merkel says her country can cope with an influx of newcomers without raising taxes or jeopardising its budget. Migrants make it to Austrian border Jump to media player Migrants are arriving in Austria after Hungary's surprise move to provide buses for them. Migrants' long walk to Austria Jump to media player Hungary is to send buses to transport migrants to Austria's border after more than 1,000 began walking there earlier on Friday. Over the weekend around 18,000 people, many of them Syrian refugees, arrived at Munich's central railway station. There were cheers from a large groups of Germans who had gathered to welcome them, with many handing out sweets and water. Video produced by Ben Allen and Kevin McGregor.